The PRASA Chair for Maintenance and Engineering Management at the University of Stellenbosch chose VI-Rail as simulation tool to aid their research in passenger rail vehicles. The chair, which started its research activities in 2009, is funded by the Passenger Rail Agency of South Africa (PRASA). 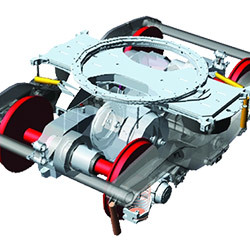 Their research activities will include studies on passenger vehicle stability, evaluating and comparing different bogie types, the effect of imperfect rail conditions, execute sensitivity studies on bogie component wear and also strive to optimize operating speeds of the various designs for various tracks. VI-Rail uses the best in class Adams Multi Body Dynamics (MBD) solver from MSC Software to compute the rail vehicle dynamics from the rail wheel interaction through to the bogie components and eventually the body of the locomotive and/or wagon(s). Initial models are built with rigid parts which can then be swapped out for flexible parts (created using Finite Element Model (FEM) technology). Flexible parts ensure a more correct load path through bodies and enable durability studies.